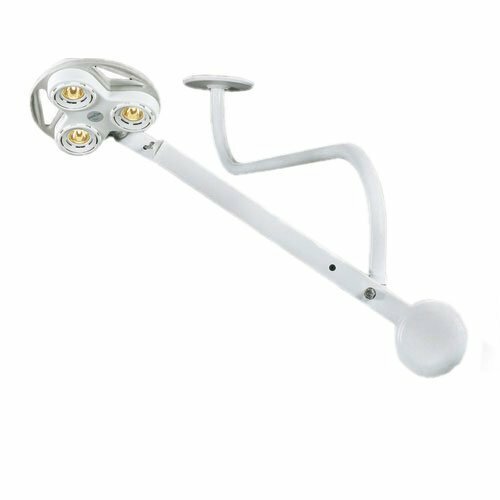 29" extension arm, 720° rotation & 69" reach to beam center, 359° lamp head/balance arm rotation in horizontal and vertical planes, Unlimited beam placement and Balanced arm rotation. Light has a 30 foot cord to transformer box (see warning below) 9.5 foot cord from transformer to wall outlet. Certified as MRI Compatible, these surgery lights are ideal for surgical applications and and specialty procedures where maneuverability and compact design are key requirements. Made of MRI compatible materials and approved by both GE and Siemens for use with their MRI solutions brings performance of a surgical light into the MRI suite. Excellent flexibility and reach combined with high performance and space saving design makes it ideal for the MRI environment. Unlimited positioning and market leading vertical and horizontal reach allow for optimal functionality around the bore. "No Tool" service minimizes risk, and the compact design limits obstruction of the work are around the MRI equipment. NEVER move the electrical box close to the magnet.